The family of Asian small-clawed otters (Aonyx cinereus) of Loro Parque return to their former area after a number of improvements in a renewed space that recreates the natural habitat of these carnivores mammals to the last detail. The renovation labours, which have lasted about three weeks, consisted of the placement of the pool and the renewal of the filtration and water quality control system. 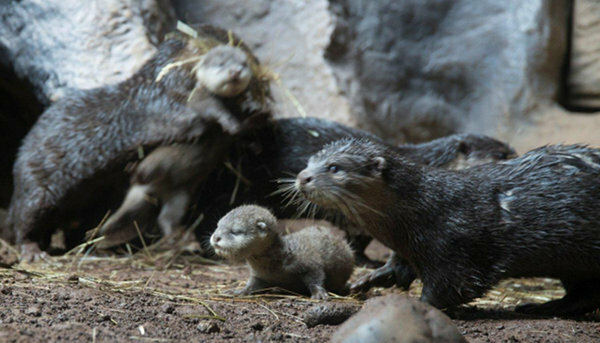 During this time, the park was fortunate to attend the birth of four baby otters, so the Zoo is happy to receive these new inhabitants that will be enjoying this renovated exhibition with all the amenities. With this new arrival of the baby otters, the family has increased to nine specimens. The Asian small-clawed otter is a mammal that has small claws and a bright brown fur with a lighter colour in the bottom; the fur is short and waterproof. For their part, this Asian otter species has shorter claws than other species, and differ due to their less webbed paws – although they demonstrate great abilities using them. They are capable of closing their nostrils and ears to prevent water from entering when they are submerged. The best zoological park in Europe and №2 in the world, according to TripAdvisor, demonstrates once again the definition of a modern zoo as a true embassy of wild animals. Loro Parque is happy to celebrate the perfect health and size of the sandbar sharks, which were born in March this year in the aquarium of the Best Zoo in Europe and second in the world, according to TripAdvisor. Abel, Airam, Lian and Juan, healthy and strong, have successfully turned five months of age – the most delicate and risky period for their species. These baby sharks have passed their first blood test after which a more specific and complete diet is created by their keepers. Even so, the baby sharks begin to make preference for hake and squid while they find themselves in a habitat perfectly adapted to their needs including in recreating a natural light during the day and a dim moonlight at night. Even the temperature of the water is maintained at a certain level based on the season of the year. These four baby sandbar sharks, just like the other representatives of their species, are true ambassadors for the protection of their own species in the oceans and the seas. These animals are in an elevated risk due the damaging human activities. As is known, the continued exploitation of the natural resources puts at risk many species of animals, among them sharks that are now facing extinction after having habituated our planet for over 400 million years. Every year more than 100 million sharks are caught and killed at sea. According to the data from World Health Organization (WHO), each year about 600.000 tons of sharks are thrown away as a useless product. Currently, 11 species already appear on the International Red List of Endangered Species, among them the sandbar shark. Therefore, Loro Parque together with Loro Parque Fundación puts forth the efforts to raise awareness about the importance of the responsible and sustainable use of natural resources and conservation of the biodiversity among more than million visitors that come to Loro Parque every year. Loro Parque strengthens its commitment to research by hosting the first non-invasive tagging test on cetaceans by placing an innovative belt at the end Keto’s tail. This pioneering study, conducted today in OrcaOcean by Icelandic and Danish scientists, consists in confirming the viability of the device and verifying that it does not create any disturbance on animals’ skin. The final goal of this procedure is to mark humpback whales in the wild. Methodically, the concept features a belt placed at the animal’s tail that includes a number of sensors to measure basic parametres. This will provide data for further studies on geolocation, feeding behaviours and vertical movements of the animal and many other aspects. Furthermore, these innovative “tagging” will be capturing and processing unique oceanographic data. This data will then be used to evaluate certain issues related to climate change and the main objective of the effort is to set up a network of sensors using humpback whales in different locations around the world. This unique tool will allow learning more about both their biology and obtain information about the climate on a global scale. The results of the test performed on the orca Keto have been satisfying: it has not caused any problem on animal’s skin and it has been ascertained that it does not affect the movement of the animal – the innovative material of the belt is flexible, impermeable and does not create friction. 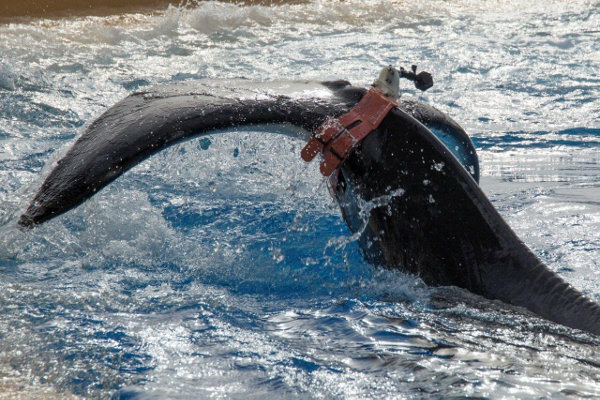 As the success of the test in Loro Parque has been confirmed, the scientists will perform the tagging of two humpback whales in Iceland, whose collected information will be used to know more about the migration processes of these cetaceans. Dr. Javier Almunia, Deputy Director of Loro Parque Fundación, and Rafael Sánchez, Head Trainer of OrcaOcean, viewed positively the initial viability of a non-invasive marking system in comparison to the traditional tagging, in which harpoons are used that cause discomfort and potential injuries to the animal. Without this kind of tests, it would not be possible to determine that the design is appropriate for use. Therefore, it has been noted that Loro Parque’s orcas contribute to scientific research and to data gathering that benefit cetaceans in the wild, performing a role of ambassadors of their species in the nature. In their Facebook page, Delfinarien-Info has published a comment of an expert, which we wanted to share with the general public taking into account constant and ungrounded criticism by extremist animal groups, with the support and encouragement from Ingrid Visser, towards the orcas kept in Loro Parque. It turns out that in reality Mrs. Visser, who has recently undertaken to give care to the stranded orca calf, has committed unthinkable number of blunders, including not having performed a post-mortem study of the animal, which could have been a very important opportunity to obtain vital data to help other orcas and whales in the future. What happened in New Zealand has caused a lot of commotion in recent days. However, I have not given my opinion about it because we are not like those who hate dolfinariums hysterically, nor are we activists for animal rights. Secondly, I use this report to demonstrate to this completely unprofessional and radical woman how a true scientist works: you wait for the results before you publish anything. The addressee of my criticism is Ingrid Visser, a cetacean researcher. This person tried to spread a touching story about an orca baby and its rescue. Why tried? Well, because the little orca has died in the process. 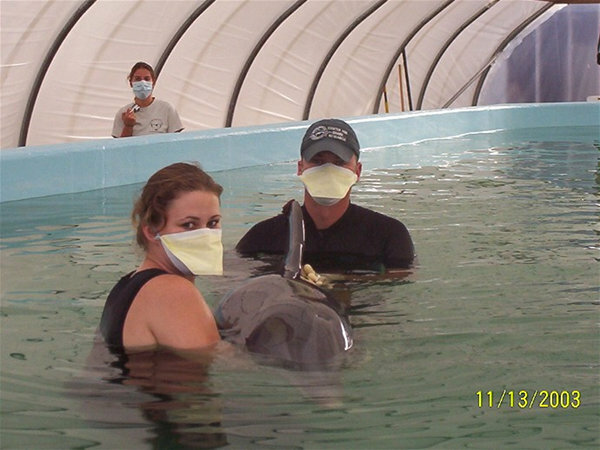 Ingrid Visser has no better to do other than to spy on dolphinariums led by the approved scientists and to discredit their professional and successful rescue programs. Such is the example of Morgan, the young female orca that was rescued on the Dutch coast by experts of Dolphinarium Harderwijk. Again, successfully. Ingrid Visser criticizes the captivity of dolphins and orcas. This is the reason why she insisted that New Zealand orca, named Bob, upon its rescue, should upon recovery, under any circumstance, be returned to the wild. Any whale rescue expert would tell her now that we must proceed step by step, and do not skip the protocol to the last phase. Of course, this is only a personal opinion. Rather, we must consider how a killer whale can be released into the wild after being pampered and treated like a pet. The pathetic way Ingrid Visser use to treat wild orcas, has been in this situation absurd. Can you rescue an orca only by talking to it or “stimulating it” using the people being present in water around it, as expressed by Mrs. Visser? Absolutely not! That is the biggest mistake you can do if you want to rehabilitate and release successfully an animal. In the SOS Dolphin rescue station in Harderwijk, I have observed many times how proper rehabilitation should be done. If an animal can swim autonomously, no human should enter the water. A man can only interfere when feeding or giving medical care to the animal. Man should not even be on the edge of the pool. Every human contact for a wild and ill orca is enormously stressful. The ignorance together with the numerous lies of this woman are unthinkable. For example, she states that the orca was placed in a pool (without filtering!!) in an undisclosed location. However, in all published images you can see dozens of people around the small pool. Of course with cameras and mobile phones. People coughing, sneezing, talking and laughing. And all this just a meter away from the young weak orca. Thank you for all these agents and germs. This is especially embarrassing because Ingrid Visser has spied on SeaWorld Parks multiple times where she recorded their practice sessions. She complained, among others, about certain medical training that was performed without gloves. Ingrid Visser must believe to have healing hands and therefore not needing gloves (unfortunately, the results have proved otherwise), or it simply did not occur to her. There arise, however, further questions. Just a few months ago, there was a publication, which stated that Ingrid Visser received a total of $ 1.2 million from an American multinational toy company in grants for orca projects. Where is the money? The tiny pool for such a major rescue operation could not have cost that much. Just as with all the other animal rights organizations, the money here disappear mysteriously. This orca’s death is tragic. 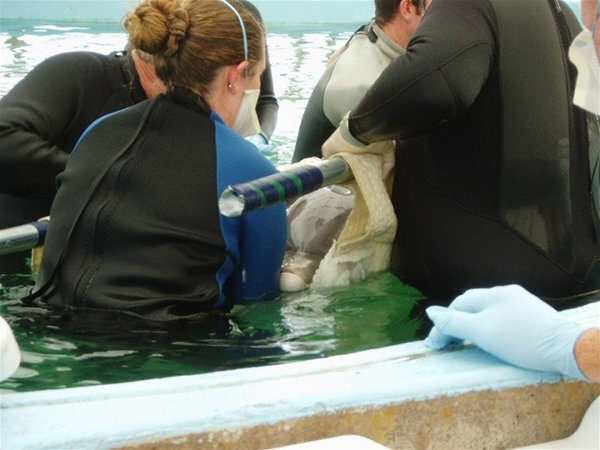 The chances of survival were minimal and dolphin rescue teams also lose many patients. But scientists can learn from mistakes. This is not the case of Mrs. Visser. Instead of requesting an necropsy, the orca was buried immediately. It is not the first time that dead animals in captivity by extremist activists disappear mysteriously. Ric O’Barry has also prevented the post mortem study of the animals. Unfortunately, we can no longer find out why Bob died. A disgrace for a woman who calls herself a scientist. As this publication above shows, the circumstances of the tragic death of the orca calf “Bob” in New Zealand leave many unanswered questions about the care that was provided to him! We must further underline that the necropsies of the diseased whales represent high scientific value and significance! They are the source of information about the illnesses that were affecting the animals and can even provide the reasons of their beaching or separation from their groups. In fact, it would be a huge blunder not to perform any type of post-mortem study on this young orca. It could be an opportunity to help other orcas in the similar situations in the future.